Join Us for Summer Solstice 2011! Summer Solstice is the longest day of the year, a marker of how the year has evolved from its birth at the Winter Solstice to full-throttle, productive life-force wave. Between Solstice and Imbolc, we let rest and cleaned our garden’s dirt. Imbolc marked the occasion to clean out and put thought and intention into the seeds we plant for the year. As we crossed the equilibrium point of Spring Equinox, we plant our seeds and intentions to grow throughout this productive season. Now, what we planted is full of life force, in motion and even bearing fruit. In this time of quickening, we feel our gatherings are a time for channeling more than just what we have known of the past – it is also a time to prepare for a future that no human has ever known before. We take the opportunity of this Summer Solstice to continue our journey as The Ones We Have Been Waiting For. As we each step into our own form of leadership, creation and contribution, we seek to first get grounded in our own being so that we may each walk strong in our journey. We hope that you will join us to explore, learn, celebrate and connect! Rooted in beginnings, we gather to honor the solar zenith! …Love and magic will reign the weekend as we dance and feast, sharing and building community! We gather with the energy of the Muladhara – the root chakra located at the base of the spine. The deity of this region is Ganesha, with coral orange skin, wearing a lemon yellow dhoti with a green silk scarf draped around his shoulders. In his 3 of his hands he holds a ladu, a lotus flower, a hatchet, and the fourth is raised in the mudra of dispelling fear. Ganesha also Reigns over beginnings. Adventure awaits! Are you grounded? Together we will deepen our anchor and salute the sun from the root of being. We seek to co-create a sacred experience during the entire gathering. We will open sacred space on Friday evening and close it on Sunday midday. Within that container, we will co-create workshops, meals, fun activities, grounding body work, and ritual. You are invited to participate! Every participant will have the chance to offer their home soil, movement, altar items, costume, and food for the event. Every participant is also welcome to help in the co-creation process for the weekend and we hope you will! This year marks our fifth year celebrating the Solstice! After a summer solstice that blew us away, we’re excited to be expanding in community and experimenting in new ways to bring forth this shared community. So…this time, we’ll be combining our Solstice Gathering with a Yule Gathering that’s been happening for a number of years as well! Date: We’re doing it on Dec 18th, which is the first time we’ve not done it on the actual solstice. Ceremony: Combining some elements from their Yule celebration with our Solstice. Notable traditions so far include candle lighting, direction calling, and burning the Yule log that was the May Pole at Beltane! We’re excited to bring in new elements of ceremony and to join forces with new collaborators. We hope you’ll join us for a night of welcoming in the new season and celebrating in community. Please find the event details and RSVP on the Facebook event here. We’re just a month away from the Summer Solstice – the longest day of the year. Hope everyone is enjoying the long days! In the rhythm of the year, Summer Solstice is after spring has sprung and the land is vibrant with the vigorous growth of plants and leaves. Green is everywhere as all the plants want to soak up the sun so they can grow. This is usually when gardens are growing strong too – summer plants like peppers and tomatoes are in the ground and now they’re growing fast and ripening fruits. It’s the time when we can sit back and enjoy all that is growing, all that is happening. At this half way point in the year, we can also take stock of what we have going on, as it is what we will be harvesting later this year. Here at the Nomads Lounge, we’ve got a bunch of spring crops we’re enjoying (a wide variety of salad greens, snow peas and snap peas, strawberries), but I can already tell they’re getting towards the end of their season. We’ve got tomatoes, peppers, hops, blueberries (and other berries), figs, peaches, cherries growing. We also created mushroom logs last month, which we may get oyster mushrooms from this year. Outside the plant kingdom, we have several projects in the works too (imagine that! ), including a cordwood sauna that is in planning phase and will be ready by Winter Solstice. This is part of a women’s space Tirza has envisioned on the property. Solstice is coming! As usual, we will be celebrating with a community gathering on the exact day of Solstice (June 21, 2010). Read more about the event here. What are you working on? What are you hoping to harvest this year? I had some initial issues on YouTube, but now we’ve got more videos posted, including fire eating and the kirtan chanting inside (extended version)! Got videos or pictures from the event? Post links in the comments please! Kegging Beer: I’m a convert! In December, we had a party that was the perfect opportunity to figure out the kegging equipment that arrived at my house. After that one experience, I’m a convert! Here’s more about kegging and my experience, which will hopefully be helpful for any other homebrewers curious about what it means to take the step to keg. The month before our party, I was traveling a bunch. I brewed several batches of beer to ensure we had some for the end of the year merriments, but leading up to the party, I didn’t have the party beer done yet. With only a month to go (and a recipe that asked for 6 weeks), I went for it anyway. The beer came out fine and finished fermenting and I racked it to hang out. With just barely enough time till the party, kegging also meant I could wait a little longer before getting it ready for the party. Generally, you just transfer your beer to the keg and put on the C02 tank and let it sit for a 2-3 days to take its carbonation (as opposed to bottling, where you put extra sugar in the bottle and wait a week for it to carbonate in the bottle). One other reason kegging made sense – it is cold! The keg was fine outside (was in 30s day of the party, so didn’t even need ice or kegarator). I had an extra business trip thrown in for the 3 days before the party. Since I was still trying to work out the CO2 (getting it filled, finding the washers), there was no way to get it all in time to have the beer carbonated with the tank. As it was, it was a lot just to get the CO2 tank filled – there are few options for filling CO2 in town in Atlanta and so it meant working it into a busy work schedule. And I had no margin for error with the party right around the corner! 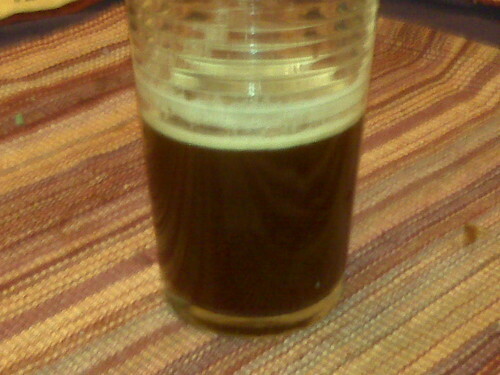 I served at around 10 PSI and put at 2/3 of the normal sugar into the keg for the carbonation. The keg wasn’t under pressure from the CO2 until time to serve. Day of the party, I pulled a beer off the keg. Perfect! Lovely tiny bubbles and great pressure (despite the fact I was guessing on most of the variables!). A few days after the party, I figured I should finish cleanup so I don’t get left with any nasty messes. To my delight, it was a cinch! Pop open the keg, rinse, clean and then store. Wow, that was easy. 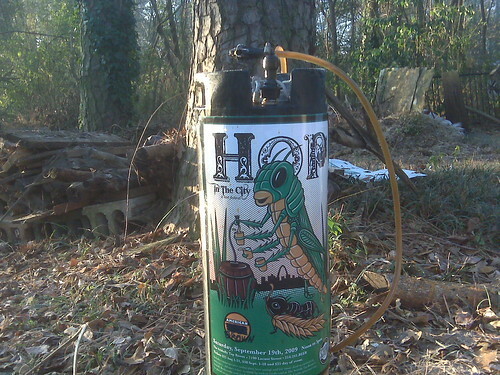 And efficient – there was probably about 2 tablespoons worth of liquid in the bottom of the keg! Thanks to my local homebrew club (FinalGravity) for support in working out some of the logistics! As I type, I’m waiting on another beer to transfer into the keg :D. For at least the cold season, this will be a great treat for me. I’m not sure what I’ll do when the heat comes back, as I don’t have a kegarator (and don’t really have space for one at the moment). I guess I’ll worry about that when I get there! For now, here’s to easy serving of beer! At the Winter Solstice Gathering 2009, our community rejoiced in our beauty and the fact that we have everything we need right here with us! In fact, we’re ready, so what are we waiting for? Recently a participant in the event told me her favorite part of the event was when we sang together. Have a listen to the voices we raised together around the Solstice fire. This song was inspired by the beautiful song from Sweet Honey in the Rock (click on the 3rd song, “We Are the Ones” on the mp3 player on rights side of page). Ok, so they got some amazing talent and we taught it to everyone in about 20 seconds :D.
You have been telling the people that this is the eleventh hour. Now you must go back and tell the people that this is the Hour. It is time to speak your truth. Create your community. Be good to each other. to the shore. They will feel they are being torn apart and they will suffer greatly. Know the river has its destination. The Elders say we must let go of the shore, and push of into the river. Keep our eyes open, and our head above water. See who is in there with you and celebrate. At this time in history, we are to take nothing personally. Least of all ourselves. For the moment that we do, our spiritual growth and journey comes to a halt. We will continue the conversations of the Solstice Gathering through monthly brunches at the Nomads Lounge. If you haven’t already received an invitation and are interested to participate in this heart conversation, please leave a comment with your contact details here.